On August 1, 2017, the Franklin County Infrastructure Bank awarded Grove City, Ohio a $2 million loan to support their construction of a municipal fiber optic network. According to the city’s Request for Proposal (RFP), the city is focused on first establishing an institutional network (I-Net) and plan to expand it to serve local businesses over time. The initial fiber optic network will connect Grove City to the South-Western City Schools, the townships of Jackson, Prairie, Pleasant, and the Solid Waste Authority of Central Ohio (SWACO). The goal is to create a network with a baseline of ten gigabits symmetric service, ten times the speed of current connections provided by Spectrum (formerly Time Warner Cable). During the August 1, 2017 general session, the Franklin County Board of Commissioners passed the resolution to authorize the loan to the city of Grove City. “[T]he fiber optics really makes a difference because companies will look at whether to expand or move there [Grove City]. It could be a deciding factor. Those are jobs that are retained that you may not see." For more information on the positive relationship between publicly owned Internet network infrastructure and reyaining or attracting jobs, check out our economic development page. In addition to the FCIB loan, the city authorized a $4.8 million bond issue for the design and construction of the network. South-Western City Schools, Jackson, Prairie, Pleasant, and SWACO will all pay an annual fee to connect to the network; that revenue will be used to pay off the bond. An October 2016 Grove City Dispatch article reported that the South-Western City School District will increase their capacity 10-fold, but continue to pay the same rate they currently pay the incumbent. Now public dollars will stay in the region to be reinvested in the local community. The project hit a snag earlier this summer when community leaders had to contend with unanticipated make ready costs. Final fees determined by electric provider American Electric Power and AT&T were much higher than original estimates. The City Council chose to appropriate an additional $2.7 million from the the city’s general fund to cover the costs and proceed with the fiber optic project. 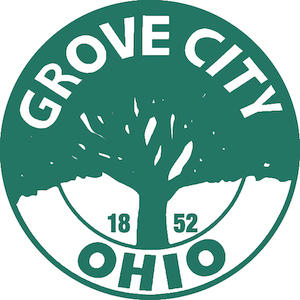 Grove City, Ohio is located in Franklin County, just 20 minutes southwest from downtown Columbus. The city covers approximately 16 square miles with a population of roughly 38,000. Faced with constrained financial resources, municipal governments like Grove City are looking for alternatives for investment in their public infrastructure projects that could increase economic growth within their communities and create more full-time jobs. Enter the Franklin County Infrastructure Bank. The Franklin County Infrastructure Bank (FCIB) is a loan fund established in 2015 by the Franklin County Board of Commissioners by utilizing a quarter-cent increase in sales tax to fund public investment in local infrastructure projects. According to the Franklin County Economic Development and Planning Department, which oversees the FCIB loan fund and the “InfrastructureWorks” program, it was “designed to encourage and accelerate public sector investment in infrastructure projects that result in economic growth and job creation.” The fund currently has an annual budget of $3.5 million for loans and officials plan to use surplus revenue to boost it to $30 million over the next five years. FCIB provides up to 10-year below market low interest loans to municipal governments within Franklin County. The loan amounts are capped at 50 percent of the total cost of the project and typically up to $1 million. Loans can exceed $1 million if funds allow and if the the Loan Advisory Board would recommend so, such as in the case with Grove City. Loans can be used for traditional municipal infrastructure projects, such as roads, electricity, and water, or economic development projects such as broadband, fiber, and transmission infrastructure. In parallel to the state fund, the FCIB is trying to fill in the gap and identify fiber infrastructure projects worth investing in. In October of 2015, the FCIB awarded the City of Upper Arlington a $1 million loan to assist in the construction of a $2.6 million municipal fiber optic network. Over the next three years, the county estimates the project will create over 300 full-time jobs. Since 2015, FCIB has allocated over $5.6 million in loans for infrastructure projects and created nearly 900 jobs.